With just over a week until kickoff, Burning Man, the annual counterculture-gone-mainstream festival in the Nevada desert, is aswarm with bugs. Reports indicate that both stink bugs and another bug that digs its hollow tongue into whatever is nearby in search of water—including human skin—are carpeting the area. An entomologist informally identified three kinds of bugs for the AP based on images: false blister beetles, false chinch bugs, and Say’s stink bug, otherwise known as green stink bugs. Why this year and no other year? No one is certain, but probably because recent rains gave rise to the necessary conditions for the boom-bust life cycle of these desert bugs to enter into a major boom phase. The bright lights don’t hurt either. Predictably, the Burning Man Powers That Be, as well as festival-goers, i.e. Burners—whom have doubtlessly been prepping their art installations for months—are put off by the infestation. John Curley at the Burning Man blog went as far as writing that if the bugs don’t clear out by August 30, the official start date, they are “gonna have to nuke the city” to get rid of them. But maybe there’s actually something that the Burning Man community can learn from this unanticipated predicament. First of all, let’s acknowledge that many God-fearing Americans already view the distinction between post-apocalyptic mayhem and Burning Man as thinner than a football field out-of-bounds line. In their minds, adding bugs to the equation is probably on par in significance with adding mosquitoes to a backyard barbeque: obnoxious but just one of the many nuisances we deal with in life. Secondly, let’s be glad it’s not the plague or lice, both of which have been worrying authorities of late. “Mutant” lice has shown resistance to treatment just as the school year starts up, and cases of the plague have popped up in California and possibly Georgia as recently as this week. 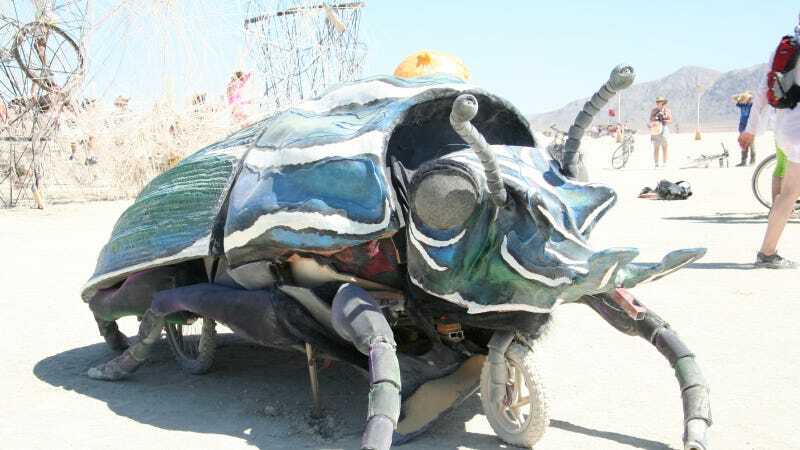 Aside from a little stink and probe, the bugs invading Burning Man’s ground are harmless. What if instead of waging war on these fickle creatures—which have just as much a right to the sand-blasted desert as humanity’s most intrepid partiers—Burning Man embraced them? Burning Man has occupied a certain escapist, anti-authoritarian space in the American psyche and the northern Nevada desert for more than 20 years. For one week around Labor Day each year, those of us with crazier impulses have been granted the type of getaway we so deeply crave—we can get out of our minds with drugs, sleep outside (and around), and have non-stop playtime with art of multifarious forms. The visuals are always stunning and the friendships no doubt enduring. Full disclosure: I have never been to Burning Man. For many years I had Burner envy (hence the "we"); but now I just don’t have that kind of vacation time to burn. Having not been to Burning Man, I feel I can wax poetic on what it stands for—or what it could ideally stand for in the zeitgeist—without getting into the Silicon Valley-ization of the whole endeavor and the way the “experience has changed.” I know tickets are getting pricey, space is at a premium, and facilities are marginal. But if the people of Burning Man can’t co-exist with some swat-able bugs for one year, then the glory days of Burning Man truly are over. Like other popular cultural affairs, such as SXSW in Austin or Coachella in California, Burning Man must be prepared to reinvent itself to remain relevant—and to avoid complete corporatization. Maybe big names and those wielding the big bucks will have second thoughts about participating in a festival that is as inviting to bugs as it is well-to-do coastal residents. For a ritual that prides itself on the chaos of creation and destruction, this could be the year that Burning Man gets its mojo back. I, for one, would marvel at a feast of brightly clad dancers, doused in mud and delusional from lack of sleep, dancing the night away blanketed by a swarm of insects. In a strange way, it would boost my faith in the future by offering a rare brand of hope, harder and harder to find in a sterilized world. Art and creativity require spontaneity. Revolution requires uprising. Change is part of life. Next year everything will be hot and sunny again at Burning Man. And for the foreseeable future it will only be getting hotter and sunnier thanks to human-caused climate change. So consider this year the year that Burning Man gives in to nature’s whim. This will happen again in the future. This will be happening more to all of us, even when we aren’t burning the house down. Maybe it’s best to embrace the circumstances for a week in the spirit of human endurance and as a symbol of our inherent bond with nature. It could turn out to be something to tell our children about the good old days: in 2015, Cecil the Lion was killed by a dentist, and Burning Man was consumed by bugs. Anyways, with any luck the bugs will move on by the end of August.